Martin Prothero originally trained as an engineer before going on to practice as an artist, as well as working in environmental education for many years. When a key contract ended, leaving him unemployed, Martin decided to start his own business, designing and manufacturing high quality wooden spectacle frames by hand. When Martin found out about the free business start-up courses offered by Outset Bristol he was keen to get all the help and advice available to him. As well as attending Outset Bristol’s Business Start Up course, Martin was referred to Outset Bristol’s sister company Outset Finance so that he could secure a £10,000 government-funded Start Up Loan to help with his business start-up costs. 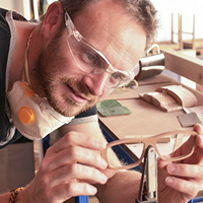 Martin’s beautiful spectacle frames are still in the prototype stage but he has ambitious plans for his new business.